Sold at Christie's Hong Kong on May 30, 2017, this tiara features a series of graduated diamond inverted arches topped with heart-shaped and floral designs. Suspended inside each section is a dangling pear-shaped diamond pendant. The diadem is set in gold and platinum and has a curved baseline, molding it to the head of its potential wearer. 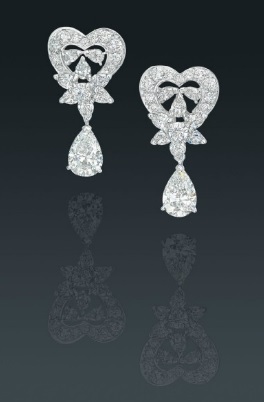 Also included with the tiara are a pair of matching earrings, each with a lover's knot stud and a diamond pendant. 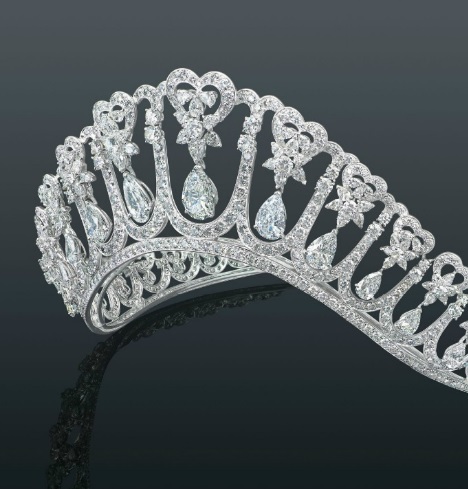 There are over 180 carats of circular and pear-shaped diamonds, ranging in color from D to E, in this tiara. The largest five pear-shaped stones weigh in at 7.78, 5.14, 4.73, 3.71, and 3.60 carats each. The pre-auction estimate for the set was $644,774 to $1,031,638; the jewels sold for $967,160 ($7,500,000 Hong Kong dollars). The heart and floral motifs at the top of the tiara and earrings are interpretations of the lover's knot motif known from several other tiaras throughout history. 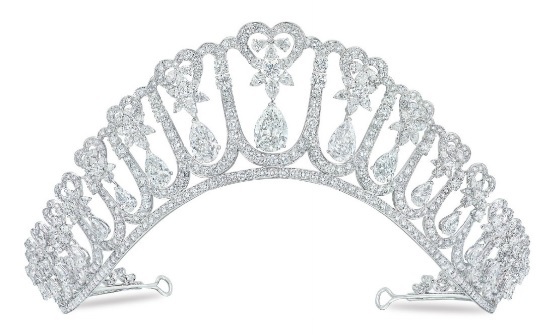 Much like diamond fringe tiaras, more than one tiara exists in this basic design. The classic model features diamond lover's knots atop a diamond structure, with pearl drop pendants dangling inside each segment. 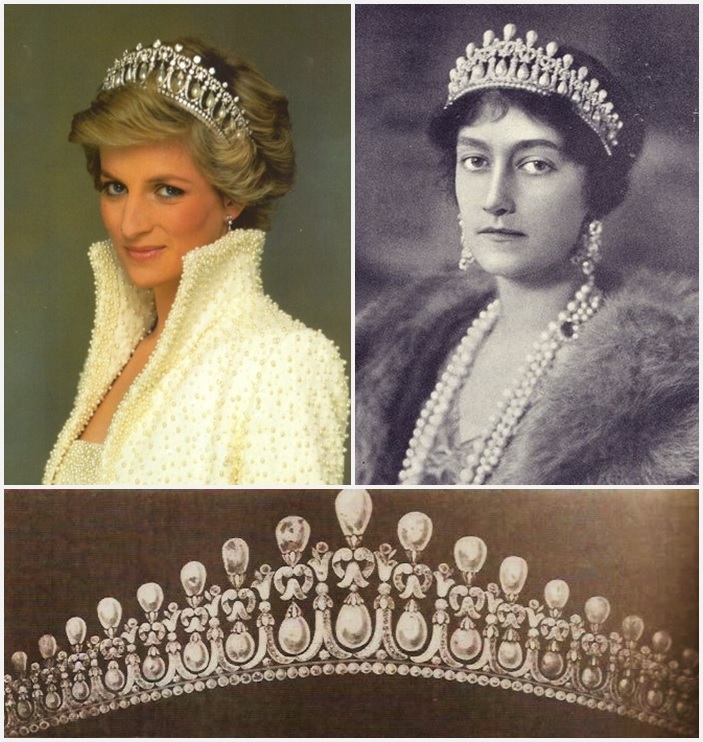 The best known example is, of course, the one popularly known as the Cambridge Lover's Knot Tiara or Queen Mary's Lover's Knot Tiara, which itself was a copy of another lover's knot tiara. In addition to a handful of nearly identical examples of this design, other tiaras have placed slight twists on the design, such as the Pearl Poire Tiara in Denmark. What's unique about this tiara is, obviously, its use of diamonds as the pendants. It's a design feature not seen as often as drop pearls (other examples with different designs include the Fife Tiara and the diamond and pearl combo of the Leeds Cartier Pearl and Diamond Drop Tiara). I don't know if it's just because I expect pearls with a lover's knot design, but - and I can't really believe I'm saying this, because I'm not that much of a pearl fan - I actually miss the contrast of a pearl drop. I'm sure the sparkle in motion of a tiara like this would change my mind right quick. Diamond or pearl pendants for you? Which royal would you like to see in this diamond version?